The Agilent N8973A noise figure analyzer is a robust testing solution that is designed for precision noise figure measurements. Its smart design works in combination today’s complex systems, excelling with a wide range of useful applications. It finds numerous applications both in designing and manufacturing environments. Many of today’s RF systems require precise noise figure specification and the N8973A is designed with that consideration in mind. It offers impressive accuracy to meet the tighter requirements of various today’s applications, and is designed to enable operators to achieve comprehensive characterization of the component under test. It capably blends the traditional features of a noise-figure meter with expanded functionality. The additional functions are included to address the latest demands by R&D as well as production-test engineers. The intuitive user interface of the N8973A noise figure analyzer enables users to carry out measurements on frequency converting devices and amplifiers with ease. Its color graphical display features limit lines and markers which allow technicians to focus on narrow ranges whenever the application requires. The noise figure analyzer is designed to deliver accurate and repeatable measurements, making it an excellent solution for a wide range of operations that demand high accuracy levels. Additionally, the intelligent design of the N8973A allows the user to set-up measurements in various viewing formats, allowing for quick printing of the test results. Learn more about Noise Figure measurements here. The real-time clock of the N8973A noise figure analyzer time-stamps data files, making it easier for users to carry out a post-analysis of the results obtained from an experiment. Its comprehensive, built-in help menu enables users to make quick reference whenever they need it. This eliminates the need for printed manuals. Users can view the measurement results on a larger display by connecting the noise figure analyzer to a VGA monitor via its VGA output port, a very useful feature for when a detailed representation of the results is required. The GPIB and RS-232 ports on the rear panel of the noise figure analyzer are used for integrating the test solution into an automated system. These ports are used when the operators are required to remotely control the tester. Its LO GPIB port provides a means of driving a local oscillator in a measurement set up that utilizes this feature. The N8973A noise figure analyzer is designed for applications in the < 3 GHz frequency coverage. The capability of displaying gain and noise figure in real-time makes it an ideal choice for measurements involving amplifiers and frequency converting devices, allowing users to apply loss corrections using its loss compensation modes. 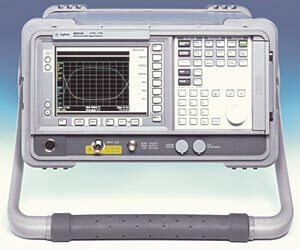 Its frequency modes allow for easy to carry out measurements at pre-determined frequencies. The technician can quickly set a specific frequency depending on the needs of any testing exercise. Contact test Equipment Connection for more information. This entry was posted in Site News and tagged Agilent N8973A. Bookmark the permalink.